The entry-level Precor 9.23 treadmill is a beautiful machine that reflects in every inch the renowned Precor quality and it offers proud owners many years of reliable workouts. The backlit LCD electronic readout shows calories, time, speed, incline, pace, profile, heart rate, and distance. 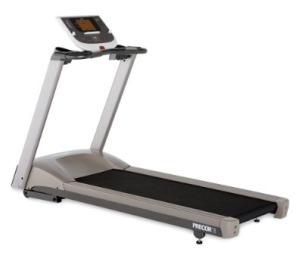 The Precor 9.23 treadmill has 6 workout programs: fun run, hill climb, interval, walk, weight loss, and manual. You can also input your weight and age for accurate target heart rate zone monitoring. Wt / Dimensions: 227 lbs / 81" x 31" x 54"
UPDATE: The Precor 9.23 model treadmill has been discontinued and is no longer available. Check out the latest Precor treadmills at the company store to find a comparable model on sale. The Precor 9.23 treadmill comes with precision-machined rollers, a powerful lift motor on the incline, multiple-zone suspension system, and a 20" x 57" running area. All treadmills need basic cleaning and care on a regular basis but Precor makes it easy on the owner; the self-lubrication deck system is no-maintenance as well as being reversible to achieve long life. The Precor 9.23’s 3.0 hp motor provides power and torque at all speeds with reliable performance whether you are a runner or primarily a walker. Every Precor motor is cooled with a constant-speed fan to prevent overheating, and is designed to perform efficiently at slower speeds. The Precor 9.23 features the patented SmartRate® heart rate display, the same software that is used on Precor club level machines. This indicator allows you to easily gauge your heart rate and keep your workout in the Target HR Zone. Precor treadmills, cycles, and ellipticals have the best console layouts on cardio machines; they are easy to use with quick keys and programming keys are clearly labeled, and all home and commercial machines share the same distinctive console design. 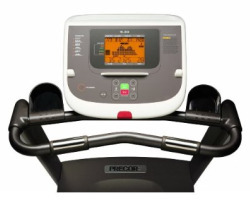 The attractive Precor 9.23 has outstanding power, a smooth and quiet operation, advanced cushioning, and a first-rate parts warranty of 10 years. Of all the Precor home models this treadmill is the best value-priced, although we would like to see it sell for about $400 less than its $2,699 MSRP. 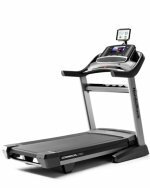 If you can get the Precor 9.23 treadmill on sale it is a solid deal, otherwise, you can also consider a top competitor, the Sole TT8 treadmill for around $2,300.